Wildlife cameraman Bob Poole talks about the challenges of filming migrating animals. How long have you been a wildlife cameraman? I’ve been interested in wildlife all my life. I grew up in Africa where my father worked in wildlife conservation. As a kid I did not have access to TV and did not see many films but was immersed in nature. I always loved adventure and got into the film business because I wanted to travel and explore. I learned the craft of cinematography and filmmaking on the job, working as a camera assistant and that led to a career as a cameraman. In my career I filmed science, adventure and wildlife documentaries all over the world for the past 25 years. About 10 years ago I decided to focus on my Africa wildlife roots, and have been working steadily there as a wildlife cameraman ever since. What were the main challenges of keeping up with the animals you followed? All animals are different, even ones from the same species. To have good results filming, you have to spend lots of time getting to know your subjects. Zebra are herd animals and a prey species so they run away when approached. The moment they sense they are being watched or followed, they run, and that makes filming zebra very difficult. 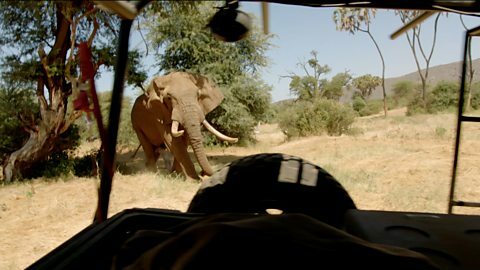 Elephants are typically quite relaxed around people in vehicles so that makes them easy to film, however, musth bulls can be aggressive and filming them is another story. They are unpredictable and it is best to give them plenty of space. Cameraman Bob Poole's vehicle gets stuck as he tries to evade battling elephants. Filming bull elephants in musth can be very exciting. Their bodies are loaded with testosterone making them dangerous and aggressive. Once I filmed an elephant walking across and open plain. He was on slightly higher ground but close enough to fill my frame against the sky, making a dramatic shot. Being in musth and having the uphill advantage, he suddenly turned and came at me. I miscalculated the speed he could accelerate downhill and he almost caught me with his tusks as I made a narrow escape in the Land Rover. You sometimes had to camp in the bush in order to keep up with your animals. What was this like? I grew up in Africa where my family spent every chance we could camping in the bush. Now, one of the things I love about my work is living simply and sleeping in the wild. Following the zebra migration through the roadless Botswana wilderness was great. After sunset, we set up camp wherever we were, cooked dinner and slept. There is something about living outdoors; food tastes sweeter, sounds are clearer and life just feels better to me. I sleep deeply, and wake up feeling fresh. I love it. What is your best tip for filming / photographing wildlife? Great wildlife shots don’t happen by accident. It is important to be able to predict what the animal is about to do next, to anticipate what is about to happen and be prepared to film it. I am always watching, learning and seeing new things when I am filming. Once I’ve seen the behavior over and over again I can plan how to get my camera in a position and configuration in order to capture the action the way I want to. Is this the toughest animal on the planet? View Is this the toughest animal on the planet?